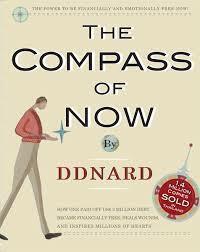 I’m so pleased today to share my conversation with Master DDnard, author of The Compass of Now. Her insights into keeping yourself in the moment truly inspired. Master DDnard will help you to remember that life is well lived in the moment. What do you think is the greatest block to personal happiness? Too much searching and not knowing how and when to stop. When your mind is reaching out, you can’t be happy. You can only try to find something or someone with the hope that they will make you happy. Happiness is very shy, it manifests when you stop searching and start feeling. Joy is always there whenever you want, just smile to yourself and be happy anytime, anywhere. Many are running their lives at break-neck speed. What advice would you give to those who have a longing to be in the now? Be in the now while running. Since you are good at multi-tasking and being a high achiever, no matter how fast you run, just set the compass in your mind to always come back to your body and mind whenever you can remember. Start now while you are reading this, and smile to yourself. Now you are in the here and now. It helps to remember to come back to your breathing and body movement as an anchor for your mindfulness. What inspired you to write The Compass of Now? When my husband passed away while my son was only eleven months old and left us with $3 million USD not in cash but in debt, I was taken out of grief and fear by just a few words of someone I hardly knew. I knew since then that when everything seems so dark, words can lighten up our days. So I wrote The Compass of Now for everyone who knows how important it is to have a positive spirit because our circumstances are the reflection of our inner states. In the book you state that parents can teach their children through good deeds. Is this a case of influencing through how we act, versus only what we say? Both what we say and act matters. Words are very powerful, especially with children. You can’t just be a good provider and a hard-working parent without expressing your love, care and understanding if you want your child to be happy growing up. We show our children how we react to things, what we say and do, how we contribute, how we do business, and it sinks into our children’s minds. Is it ever okay to be unhappy? Yes, but not for too long. You may get the habit of it. So allow yourself to be unhappy for a short time and then say to yourself: “Time’s up- it’s time to be happy and enjoy the best life brings.” Also, don’t forget to look for the good things in disguise. Master DDnard is a renowned spiritual teacher and best-selling author of the Compass book series, including The Compass of Now. DDNard also conducts her charitable Compass Meditation Retreats four times a year at a mountain resort in Thailand, where hundreds of participants come to meditate and everything is paid for by her special charity fund. She also conducts free Happiness Compass Seminars four times a year. Today she leads a quiet life on the beautiful river bank of Bangpakong, Thailand, meditating, gardening and playing with her son.has been invited to give her insights on hundreds of TV shows, magazines, and organizations.